Grace College students presented at the Alpha Chi honor society’s national convention in San Diego, Calif., in late March. 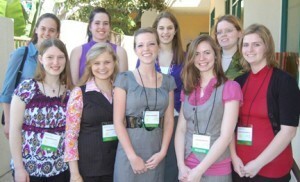 Pictured, from left to right are, (front row) Alysha Mroczka, Emily Metcalf, Julene Holladay, Jennifer Benner, and Katherine Aardsma; (back row) Margaret Gullman, Abigail Dutcher, Melissa Witwer, and Sarah Rice. Nine Grace College students and one professor traveled to San Diego, Calif., at the end of March to participate in the Alpha Chi honor society’s national convention, where each of the students presented academic papers in his or her field of study. Professor Joseph Lehmann, faculty sponsor for Alpha Chi at Grace, said Grace was recognized as a star chapter for the third consecutive year. Among the 276 students who participated at the convention, two Grace students won first place recognition in their respective categories – senior Jennifer Benner in English Literature and junior Emily Metcalf in Original Visual Art. Katherine Aardsma, “Anorexia Nervosa: The Psychological Lie Impacting Our Society,” Psychology. Jennifer Benner, “It’s Just Eating Babies: A Text World Theory Approach to Understanding the Effectuality of Swift’s ‘A Modest Proposal’” English Literature. Abigail Dutcher, “The Integration of iPods into Pedagogy,” Education. Margaret Gullman, “The Biology of a Self-Sustaining Aquarium,” Ecological Biology. Julene Holladay, “Self-Directed Learning,” Education. Emily Metcalf, “The Convergence of Cultures (and Colors): An Artistic Exploration,” Original Visual Art. Alysha Mroczka, “Prairies: A Contrast Between Miller Field and Koinonia Environmental Center,” Ecological Biology. Sarah Rice, “Heart of the Highlands: Clearances, Famine, and Culture,” World History. Melissa Witwer, “Improving Patient Adherence to Diabetes Care Through Integrated Care and Psychological Interventions,” Health Science. Alpha Chi was founded in 1922 as a coeducational society whose purpose is to promote academic excellence and exemplary character among college and university students and to honor those achieving such distinction. Its name derives from the initial letters of the Greek words alethia and character, meaning respectively truth and character. The motto of Alpha Chi is, “You shall know the truth, and the truth shall make you free” (John 8:32).